A screen grab from an ISIS video shows Zulfi Hoxha of Margate, N.J. issuing threats against the United States. Dressed in heavy combat gear and cradling a large automatic weapon, the young man looks every inch like a character in the violent video games he played just a few years before. "America today is the one carrying the banner of the cross and waging war against the Muslims," he declares to the camera in excellent English. "It openly declares that its goal is only to wipe out the Islamic State. May they fail and lose." 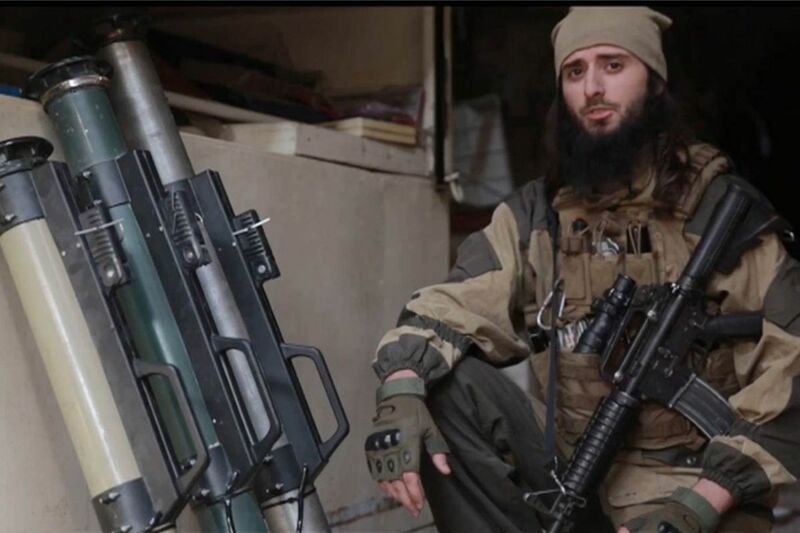 The video features Zulfi Hoxha, now 26, the son of pizza shop owners in Margate, N.J., and a 2010 graduate of Atlantic City High School who left the United States three years ago to emerge as an ISIS commander and propaganda star. In court papers filed in federal court in Massachusetts last year, prosecutors identified the Albanian American Hoxha as a ISIS leader and, in a rare move, officially identified him as the figure in an ISIS video accusing the U.S. of waging war against the Muslim faith. In an even more chilling video, American officials told the Atlantic magazine, Hoxha is the black-robed masked man shown beheading a captured Kurdish soldier. He is in a tiny cohort — among a few dozen Americans known to have left the country to join Islamic terrorists. Perhaps the most notorious was Anwar al-Awlaki, an al-Qaeda recruiter and U.S. citizen killed by a drone airstrike in 2011, after President Barack Obama secretly approved the targeting. In a lengthy article, the Atlantic chronicled Hoxha's path from New Jersey to Iraq, his ties to other plotters later convicted of a plan to kill conservative provocateur Pamela Geller, his 2015 arrival in the Middle East, and his enrollment in an ISIS training camp. He is still at large, presumably still in the Middle East, where he goes by the nom de guerre Abu Hamza al-Amriki – the last name Arabic for "the American." "His high school friends said he was a bit of a loner – goofy," said Seamus Hughes, an author of the Atlantic piece and deputy director of George Washington University's Program on Extremism. "You have this seemingly random guy, three months after joining ISIS, is one of the faces of their propaganda." Hoxha's radicalization, Hughes said, "speaks to how social media lowers the bar though which young men and women join terrorist organizations." In the beheading video, released six months after Customs records show that Hoxha left the U.S., he says he is "delivering a message to Obama" before killing his first victim. In the other video, made public last year, he declares that U.S. "savage air strikes have killed and wounded thousands of children, women and elderly." "Therefore," he said, believers should carry out attacks on U.S. soil against kaffirs – non-Muslims. "Are you incapable of stabbing a kaffir with a knife, throwing him off of a building, or running him over with a car?" Hoxha asks. "Liberate yourself from hell fire by killing a kaffir." Hoxha's family roots are in Albania, the impoverished country in Eastern Europe whose population is heavily Muslim. The family has owned two adjacent homes on a modest block in Margate for about 40 years, and operated Pierre's Pizza on Washington Avenue there for more than a decade before selling it in 2005. The family lived in a small two-story house adjacent to the pizza shop, just steps away from the busy, shop-lined Ventnor Avenue, two blocks from the beach and three blocks from the bay. The blinds were drawn on Friday afternoon, and no one answered the door when an Inquirer and Daily News reporter visited. A handwritten note, slightly misspelled, was taped to the door. "We do not wish to talk," it read. "We are devistated. Please give us our privacy." A small American flag was tucked above the door frame. This note was taped to the door of the Margate home of the Hoxha family. A woman at the home hung up the phone when a reporter called on Friday. On Wednesday, a woman identified by NBC10 as Hoxha's mother told the station: "No good. I'm very upset." On Friday, outside a surf shop around the corner from the house, a man unloading boxes shook his head at news of the ISIS connection. "That's gnarly," he said. "It's the world we live in." The pizza business has continued under new owners. The current operators bought the shop four years ago, keeping the name unchanged. "I have a family to feed, and this has hurt me a ton, because now people think I am connected to ISIS," operator Richie Hafizi told the Atlantic City Press. "We've gotten calls from people asking for pizza with a head on top of it, and other crazy calls." Zulfi Hoxha in his 2010 yearbook picture from Atlantic City High School. Hoxha grew up in Margate with two brothers and a sister. His Albanian-born father died at age 54 when he was 13 and the family got out of the pizza business soon after. He attended Atlantic City High, the high school for the resort city and four adjacent Shore towns. In his yearbook photo, Hoxha was a wearing a tux and had a flower in his lapel. Like other young men, he frequented Twitter and apparently was a video-game enthusiast. A few digital footprints on Twitter show a man using the name ZulfiHoxha in conflict with other users, with one telling him, "F– off you terrorist scum" and another saying, "Terrorist, you wish." Twitter records also show him exchanging messages with the State Department's "Think Again Turn Away" program, an attempt to combat terrorism on social media. Under the username Hoxha77 — as well as alias names KiickassBarbiie, MoSt H8TED119 and Smashing IdOls — he registered in 2013 with a popular online gaming site to play against others in such games as Left 4 Dead 2, Mortal Kombat, Codename: Panzers and World in Conflict. He last left a digital track on the site in January 2015, not long before he flew to Turkey on his way into the Mideast. He played Tom Clancy's Splinter Cell, in which gamers pose as an NSA agent hunting terrorists. Hoxha's unusual role as one of a handful of Americans linked to ISIS was recently made public by prosecutors as they pursued the successful prosecution of David Daoud Wright, another accused American terrorist, albeit one who never left U.S. soil. Wright, 28, was sentenced to serve 28 years in prison last month for plotting to kill Americans, including police and Geller, on behalf of the Islamic State. During the trial in October, defense lawyers portrayed Wright, who weighed more 500 pounds in 2015, as a jobless sad sack who deluded himself into thinking he was an ISIS warrior. But after the jury's verdict in the case, the judge in the case termed Wright a committed terrorist. In trial testimony, witnesses said that Hoxha, an apparent gaming buddy of Wright's who communicated with him through the Paltalk chat network, had recruited Wright to the ISIS movement. In turn, prosecutors said, Wright had encouraged Hoxha to go overseas, and he and his uncle raised money to help pay Wright's travel costs by selling Rahim's laptop on Craigslist. Until his arrest, prosecutors said, Wright was in touch with Junaid Hussain, a Syria-based but British-born ISIS "cyber recruiter" who was killed by an air strike in August 2015. At the trial, the Atlantic reported, the government also presented evidence that Hussain kept Wright's uncle posted on Hoxha's location. Among other evidence, the Atlantic reported, were text messages exchanged between Rahim and Hoxha after the latter left New Jersey for the Middle East. "In the safe house," Hoxha said four days after his departure, adding that he was looking at three months of training. "Keep in touch," Rahim responded. "We were worried about you." "Don't worry," Hoxha replied. "The kuffar can't touch me now. LOL."